ABERDEEN, S.D. – Years ago for a middle school geography project, Kristen VanDeRostyne had to pick a global destination to plan a faux vacation – mapping out the entire trip, from choosing a hotel to pretending to purchase a ticket. Now a senior at Northern State University, her childhood dream is coming true. VanDeRostyne, of Parker, has an internship in Australia this summer – and she couldn’t be more excited for the experience. “This has been a huge goal of mine since I was in eighth grade,” said VanDeRostyne, a business management major with a minor in international business. She begins her six-week internship on May 20. VanDeRostyne will working as a marketing and sales intern at RACV Royal Pines Resort in the Gold Coast. VanDeRostyne’s internship is through the API study abroad program. Fellow NSU student Gracelynn Miller will have a similar summer experience, with an overseas internship at a clinic in Valencia, Spain. Internships abroad are available to all students through Northern’s partners, said NSU Study Abroad and CEIB Advisor Dominika Blum. While over 50 participants are taking advantage of study abroad programs, this summer alone, not many have taken advantage of an overseas internship. “I think Kristen and Gracelynn are unique students who know what they want and why this experience will set them apart from everyone else graduating with the same degree,” Blum said. Miller, a junior human performance major, will be in Spain for her internship May 22-July 20. She said traveling has always been a goal for her, but it’s expensive. In looking at options, she realized she needed an internship – and she found one with the Spanish clinic, Clinica Aston, on the ISA program website. Miller’s duties will include shadowing and assisting clinic professionals; observing and getting involved with patient evaluations; and assisting with planning patient rehabilitation programs. She is considered an “intermediate” Spanish speaker, so she was placed with a Spanish-speaking clinic, though the staff also know English. 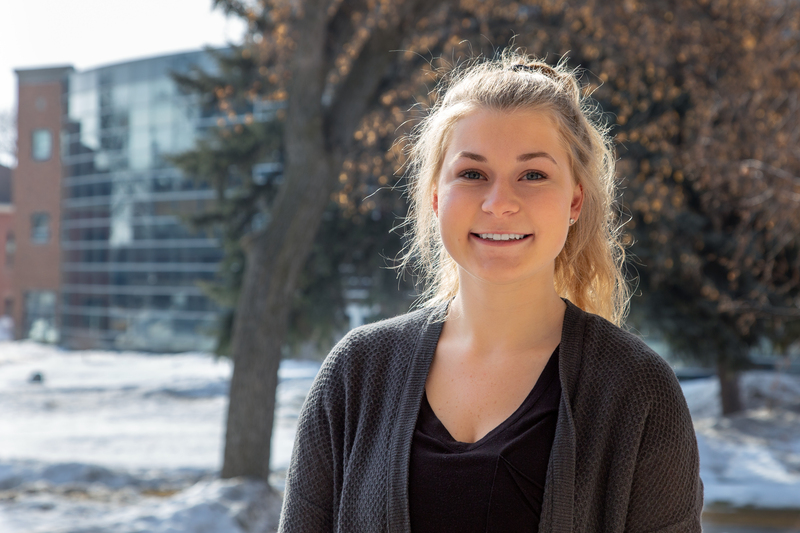 The only other country she’s traveled to before is Canada, and Miller said she’s most excited about being in a different country and learning the culture – and also experiencing how the field of physical therapy differs there. Once the travel bug hits, it might not let her go – Miller said she’s considering applying to a physical therapy program in Aberdeen, Scotland, after she graduates next year. This won’t be VanDeRostyne’s first time traveling overseas – she has been on vacation to Italy, and was also deployed to Jordan as a member of the South Dakota Air National Guard. She’s most looking forward to getting hands-on experience at an international company. The internship will provide real business experience and allow her to see the global market. “We always learn about it, but I want to see it actually applied in the real world,” VanDeRostyne said. Miller chose Northern because she was recruited to run track and cross country for the Wolves. But although she came for athletics, she has enjoyed all aspects of Northern. She also likes the tight-knit Aberdeen community. One NSU faculty-led program to Cambodia, Thailand, led by Drs. Erin Fouberg and Steven Usitalo with 20 participants. One NSU faculty-led program to Spain, led by Drs. Anna Schwan and Andria Moon with 17 participants. One student received a $5,000 scholarship to take part in a summer program in Japan. 15 Wolves will be participating in a variety of summer study abroad programs all over the world: Italy, Chile, Costa Rica, China, South Korea and Japan. It’s not too late to apply for these programs. For more information, contact Blum at Dominika.Blum@northern.edu or visit NSU Study Abroad online. Northern State University is a regional university that offers outstanding academics and exceptional extracurricular activities at an affordable price on a safe, welcoming campus. Northern State recently announced its Educational Impact Campaign, with a goal of raising $55 million for a new South Dakota School for the Blind and Visually Impaired, new athletic and recreation fields, and an on-campus regional sports complex. Once the campaign is complete, NSU will be the recipient of more than $100 million in privately funded building projects and scholarships within a decade. To learn more, visit NSU Admissions.